They are back and so is this special!!! Service managers pothole special. Rotate and balance tires, 4 wheel alignment and brake inspection. Oil & filter change special. Buy 3 Tires Get The Fourth For $1! 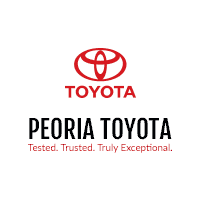 Peoria Toyota is proud to offer competitive prices on all our services. If you’re looking for the best Toyota service and parts in Central Illinois, look no farther than Peoria Toyota. We proudly serve Peoria, Dunlap, Morton, Washington, Pekin, & everywhere in-between. Shop online and browse our service menu for recommended maintenance on your Toyota. We have everyday pricing for Fuel Injection Service, Balancing Tires, 4-Wheel Alignment, Manual and Automatic transmission, air and cabin filter, pol changes, drive belts, and more!